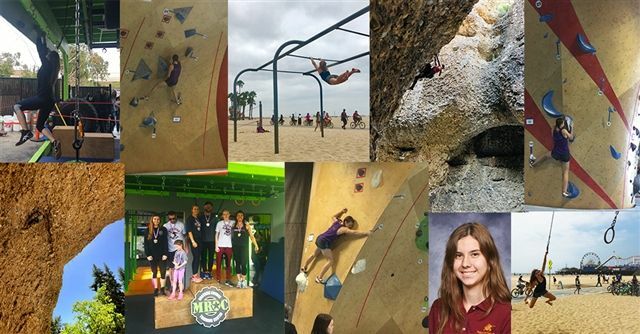 Izabella mostly climbs indoors in climbing gyms because it is easier to train for competition but she also loves to climb outside. “I stay motivated mainly because I love the sport and the community but also through competition,” Izabella said. “I really love competing; the route setters always create such cool routes and I thrive as an athlete under the pressure of competition.” Climbing is a growing sport and will be included in the Olympics for the first time in 2020. Izabella first saw the show American Ninja Warrior a few years ago. “I always thought it looked so fun but I didn't have the equipment to train for it and the closest ninja gym is a two-hour drive away. Then last summer, when my younger sister became interested in the sport as well, we decided to start building a course in our back yard. We currently have about 20 obstacles from the show and we are constantly changing and adding new ones.” Izabella and her sister started competing in ninja in January through the Ultimate Ninja Athlete Association (UNAA). Izabella placed first at the area qualifier in Phoenix earlier this year. Izabella recently placed third in the regional competition in San Diego at the beginning of March. She qualified to compete for the World Finals coming up in July in Minneapolis! “Three years from now,” Izabella said, “I will finally be old enough to compete on the show, so until then I am just training. My goal is to complete all four stages of Mt. Midoriyama and become the youngest and first female finisher of the course.” Only two people have completed the entire course.